There is global recognition by education policymakers that, in order to equip children with the ability to succeed in today’s rapidly changing world, students need to be taught a breadth of skills beyond numeracy and literacy. Skills such as communication, collaboration, and critical thinking are not merely desirable outcomes of education; they are necessary to meet the global challenges of the 21st century. Education officials, teachers, donors, researchers, and other stakeholders are increasingly examining how to cultivate these skills within education systems. As part of the Skills for a Changing World project, we conducted an initial scan of 102 countries to investigate the degree to which breadth of skills is reflected in national education policies and curricula (see preliminary report). What we found was that there is a strong indication that education systems are beginning to expand beyond traditional academic disciplines; however, there is great variation in the degree to which a broad range of skills is being integrated at the different levels of the education system. In order to continue tracking the breadth of skills movement, additional country data will be collected and updates to existing data will be made quarterly. For this quarterly update, a total of 18 updates, were made between September and December 2016. Figure 1 provides a summary of 11 countries that were newly added, as well as the countries that were updated. The interactive map depicting the breadth of skills movement across education systems reflects these additions and changes. 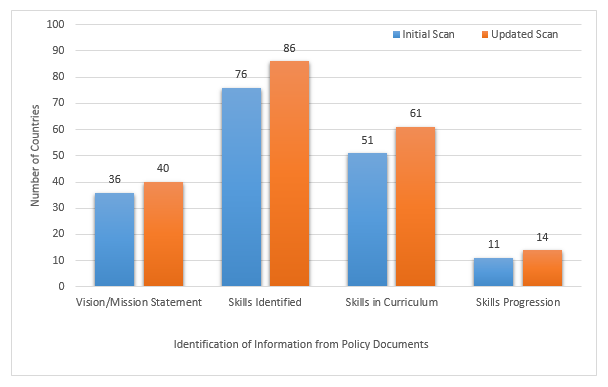 Although information was included to reflect the most current national documents, the coded data based on the criteria established for the four sets of information (mission and vision statements, skills identified, skills in the curriculum, and skills progressions) did not change much. 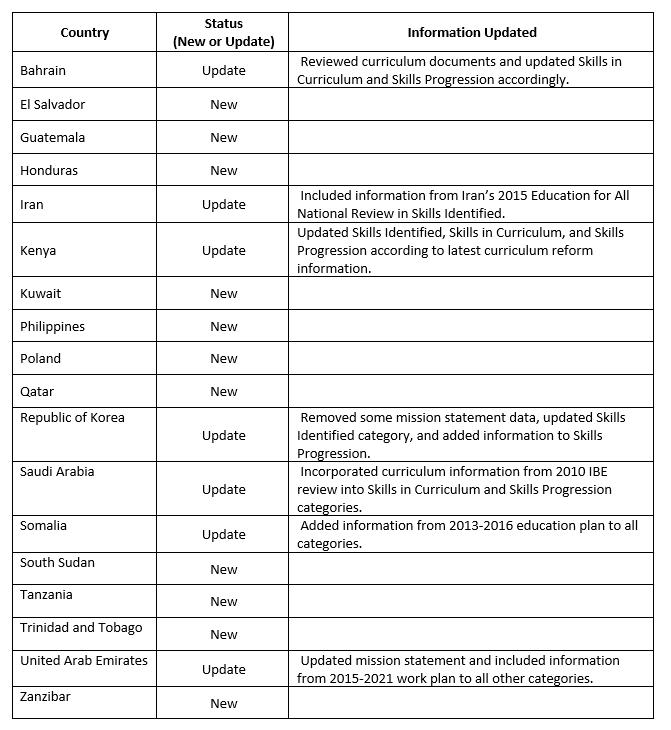 Of the seven country updates, the only data changes around incorporating breadth of skills were for United Arab Emirates (criteria now met for skills identified, skills in the curriculum, and skills progressions) and Kenya (criteria now met for skills in the curriculum). Note: Zanzibar is a semi-autonomous part of Tanzania and has a separate government and education system from mainland Tanzania. What remains the same? What changes? Regardless of the changes in data for seven of the countries, along with the addition of data on 11 new countries, the evidence of a shift toward a broader focus on skills beyond literacy and numeracy remains consistent. Figure 2 shows a comparison between the initial scan of 102 countries and the updated scan of 113 countries. With the inclusion of the new data, evidence points to a higher rate in identifying a breadth of skills within national documents (except mission and vision statements) and in including descriptions of skills progressions. Importantly, this finding cannot be generalized to all countries; rather, they are specific to the countries included in our database. 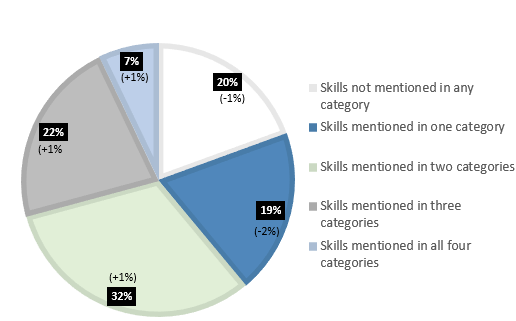 In considering the pervasiveness of breadth of skills within national policy documents, there continues to be variability across countries in the number of categories that mention skills (Figure 3). 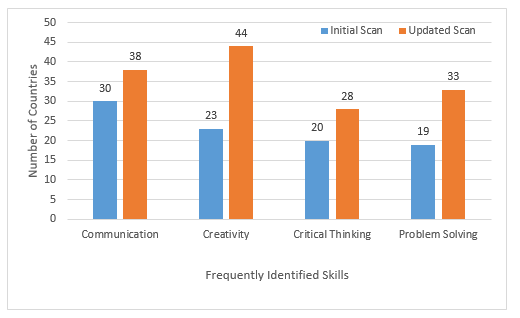 Consistent with findings from the initial scan of 102 countries, communication, creativity, critical thinking, and problem solving were the most frequently mentioned skills (Figure 4). With the current update, we included variations of the identified skills to better understand the most frequently identified skills. For instance, the skill of “communication” also includes “communicate,” and “creativity” also includes “creative thinking” and “think creatively.” With the variations, creativity, not communication (although a close second), was the most frequently identified skills, mentioned by nearly 40 percent of the countries. Note: The parentheses reflect changes in the percent of countries from the initial scan. A negative percent indicates that the percent of countries in that category decreased; a positive percent indicates that the percent of countries increased. The four categories include: 1) vision/mission statement; 2) skills identified; 3) skills in curriculum; and 4) skills progressions. The next update will be provided in April 2017. Please help track the breadth of skills movement globally by adding new country data and/or sharing any missing information here. We are especially seeking new data from the Central and Eastern Europe region. Acknowledgements: We want to thank Meaghan Malloy and Celina de Sola at Glasswing International (El Salvador, Guatemala, and Honduras) and Maysa Jalbout and Nadia Nasib (Bahrain, Iran, Kuwait, Qatar, Saudi Arabia, Somalia, South Sudan, and United Arab Emirates) for their contributions.